How have you selected today’s artists? 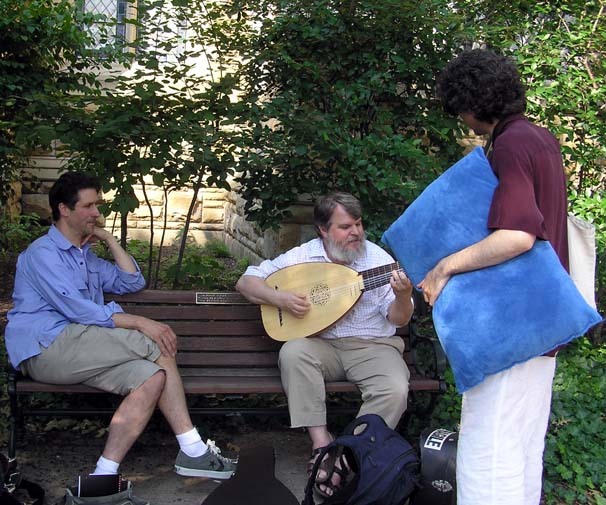 POD: David and I wanted to assemble a group of brilliant instrumentalists who have invested considerable time and thought into the performance of Bach on the guitar and lute, and whose approaches demonstrate the variety of ways in which this music may be brought to life. Whereas some music seems to be most effective when played in a certain way, Bach is so universal that hearing different interpretations side by side provides an even greater appreciation for the depth and complexity of his music. What is it about Bach that brings artists to him again and again, regardless of instrument or genre? POD: A lot of music unveils its charms clearly at first hearing. But as with all great art, Bach’s music is multi-layered. It is enjoyable the first time, but the complexities and depth can only be fully appreciated after repeated probing and exploration. To convey the overall architecture as well as the most intricate details is a challenge of which one never grows tired. The music reveals new insights every time it is played. Bach had a rather complicated relationship with the lute, didn’t he? POD: Bach seems to have been enamored of the lute, but he was not a virtuoso player of it, so he invented a new keyboard instrument, theLautenwerk, to imitate the sound of the lute. He wrote a number of suites for theLautenwerk in the style of lute music which were then edited in the Bach Gesellschaft edition as “Bach’s Lute Works.” Classical guitarists in the mid-20th century were inspired to make arrangements of the pieces; the quality is, of course, extraordinary and the style is designed to emulate lute music so it appeals to both guitarists and lutenists. However, the original Lautenwerk pieces do not fit the standard 18th-century German lute, a fact that has spawned numerous theories about exotic scordatura tunings Bach might have used to render the pieces playable. 18th-century lutenists arranged some of the pieces for the Baroque lute, changing those notes and chords that did not fit the lute. So while lutenists are loath to accept it, the simple truth is that Bach wrote keyboard works in the style of lute music, and he would have appreciated lutenists arranging them to fit the lute, regardless of the changes it might have required to render them playable. It is both the quality of the music and the complexity of the historical possibilities that makes these works endlessly fascinating. You have added a few non-Bach works to the line-up. Can you tell us why? POD: The non-Bach works all have special functions, including to provide a taste of the lute music Bach listened to and emulated. His admiration for the music of Sylvius Leopold Weiss was such that he borrowed an entire Weiss lute suite note for note. He used the lute solo as an obbligato harpsichord part over which he composed a new violin part. This violin sonata, BWV 1025, is not often performed because many players don’t quite know what to make of it. But by comparing the lute version with Bach’s setting of it, it is possible to understand exactly how Bach put it together and how it works. There are some details in each version that help to clarify aspects of the other, so it is important to look at both versions when performing either one of them. To conclude, a personal question: what are your favorite Bach works, both for lute and in general? POD: I never like declaring favorites because it is like having to choose between one’s children. In the case of Bach, I am generally most fascinated by the piece I am currently working on. That being said, the Fugue from BWV 1001 has been a favorite of mine since childhood, and I still find new things in it each time I play it. As far as non-lute music is concerned, I am always deeply moved by the St. John Passion. The dramatic construction and pacing are so tight and the balance of effects so brilliantly judged that it feels like an opera to me. The final chorus, “Ruht wohl,” is one of my all-time favorite pieces of music. Then there is the beautiful accompanied recitative with lute obbligato. So even though I’m supposed to be talking about non-lute works, the lute slips in.